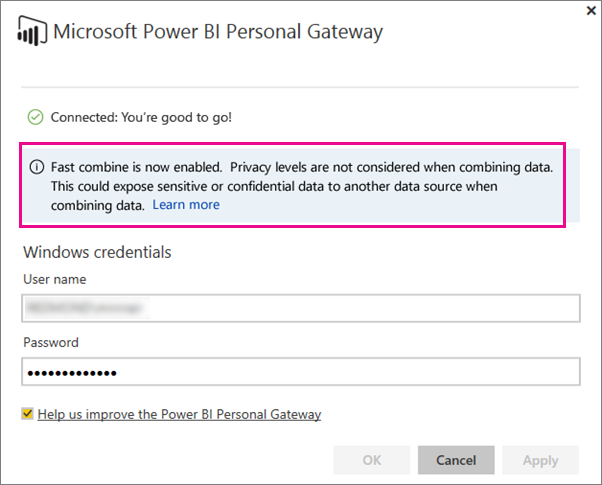 This month’s release of Power BI Personal Gateway is packed with new features and improvements. As with the previous releases, this release is an in-place upgrade. You do not have to uninstall the Personal Gateway before installing the new version. You can download the latest version from within your Power BI account. 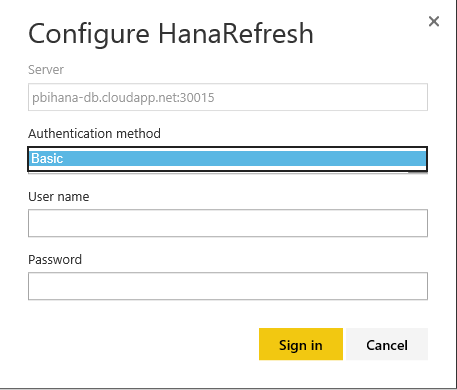 In this release, we have added refresh support for two new data sources – R scripts and SAP HANA. In addition, we have added a new feature to enable fast combine in the Personal Gateway. 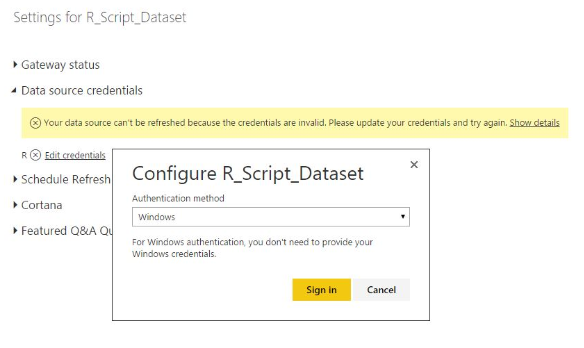 With the November release of Power BI Desktop, you can now create workbooks that connect to R Scripts. 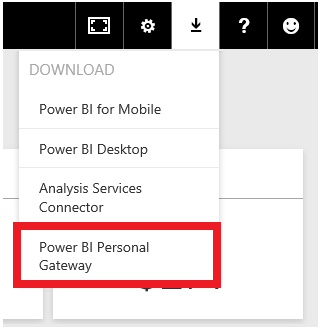 To be able to refresh these datasets in Power BI, you need to download and install the November release of the Personal Gateway. 2. After uploading the dataset, click on “Scheduled Refresh” option on the dataset. Then Click on “Edit Credentials” next to the R data source. 4. The error bar will disappear and the next step is to set up the scheduled refresh. As soon as you toggle the “Keep you data up to date” to on, you’ll be shown a prompt to validate that you trust this data source. 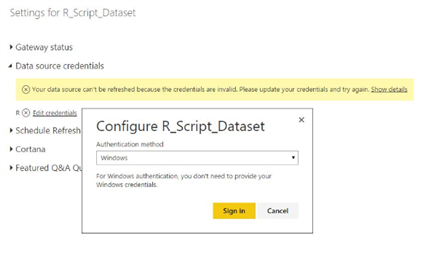 This is to ensure that you are aware that you are running the R script in the service. 5. Once you click OK, you can set up the schedule and save it. Your dataset will refresh as per the scheduled you set. You can also refresh it on demand by selecting “Refresh Now” from the dataset options. 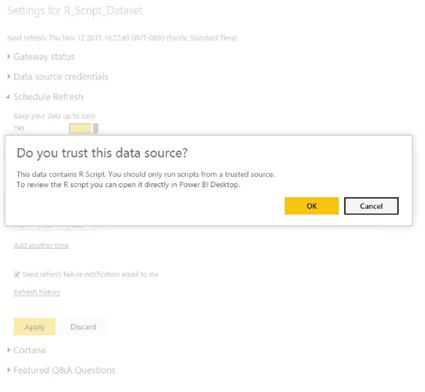 The November version of Power BI Desktop added yet another data source – SAP HANA. And to refresh your datasets connected to SAP HANA, you need the November version of Personal Gateway. The experience to schedule refresh for SAP HANA dataset similar to scheduling refresh R datasets. Once you have installed the latest version of Personal Gateway, ensure that you have also installed the SAP HANA ODBC driver on the same computer where the gateway is running. You can download the driver from the SAP download page. During edit credentials, you have to select “Basic” Authentication in the credentials dialog. Then specify your username and password to connect to the database. Rest of the experience is the same as scheduling refresh for any other dataset. An error occurred while processing the data in the dataset. 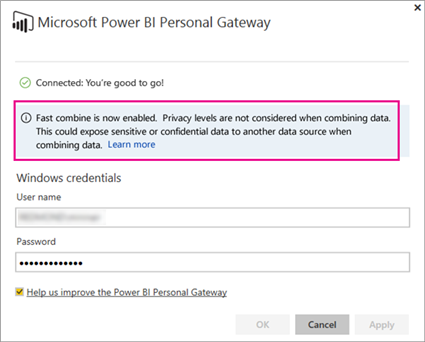 [Unable to combine data] <query part>/<…>/<…> is accessing data sources that have privacy levels which cannot be used together. Please rebuild this data combination. To fix this error, the solution is to turn on “Fast Combine” in the Personal Gateway. You can read more about the Fast Combine and Privacy levels here. You can use the following steps to enable Fast Combine for your gateway. 1. Open ConnectorConfig.xml. This may be in one of two locations on your machine. If you are an administrator on the computer, it will be the following. 3. Exit and re-launch the gateway configuration screen. 4. You will see a status letting you know that Fast Combine is enabled. To Turn off Fast Combine, remove the <EnableFastCombine> element from the config file. In addition to the features in Personal Gateway, we have also added a notification to the Scheduled Refresh Setting page when a new version of the Personal Gateway is available for download. You can click on “Upgrade Gateway” to download and install the latest version of the Personal Gateway. It is important that you are always on the latest version of the Personal Gateway to get access to the latest features and also to ensure that you have the latest version of M engine. Stay tuned for updates every month. We’ll continue to release fixes and updates to the Personal Gateway. You can learn more about the Personal Gateway here.